Work travels recently brought me out to Chicago again — for my shortest work trip ever (1.5 days), I might add — and since I was in need of a quick meal for lunch in between working hours, I stopped by the local Eataly* to grab some good eats, since it was nearby my “office” for the day. 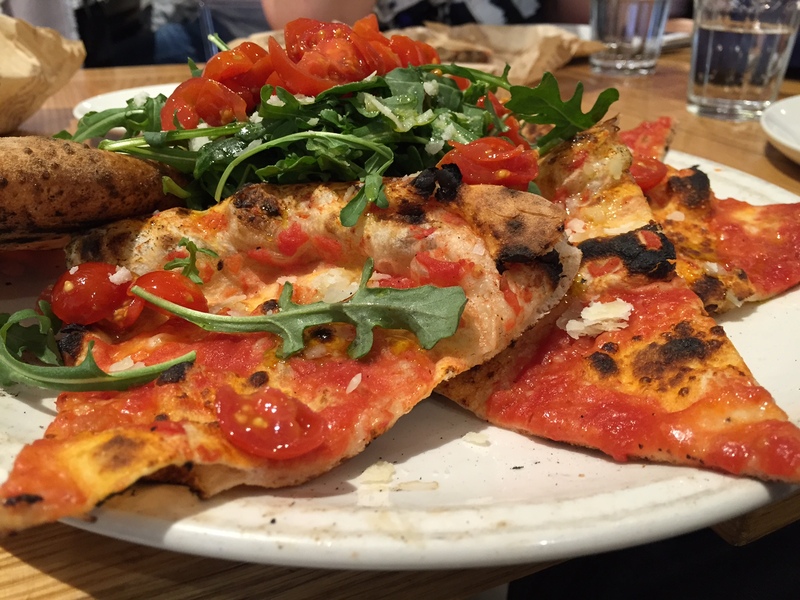 I dined at Eataly’s La Pizza & La Pasta station again, since I had a decent experience there last time a year and a half ago. This time, I wasn’t terribly hungry, so decided to order an appetizer instead of an entree. 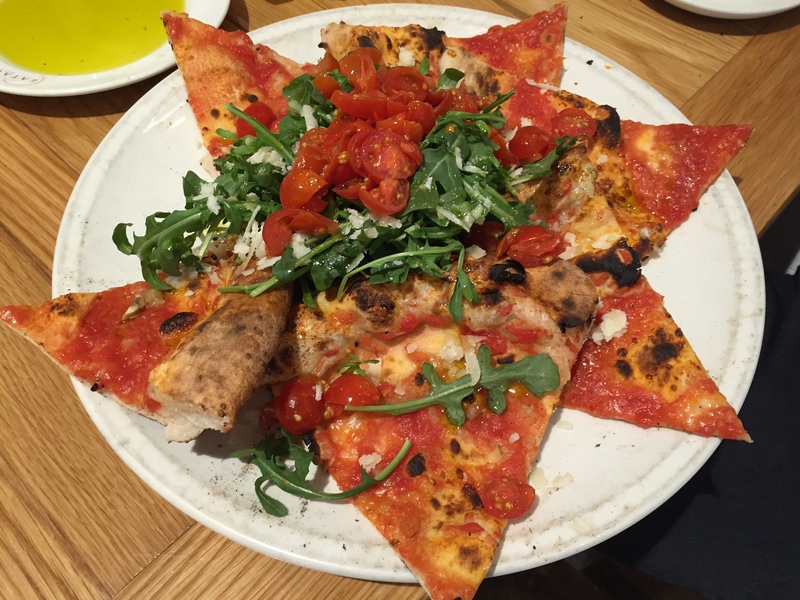 I ordered La Stella, described as pizza with cherry tomato, arugula, shaved grana padano, fresh basil, and extra virgin olive oil from Sorrento. Sounds delicious, right?! Just reading the description made my mouth water, and I had no regrets at all about ordering it once it came to the table fresh from the coal-fired oven! Life has gotten so busy lately… but I suppose that’s to be expected when you’re working full-time and completing a Master’s degree! Hopefully after a couple months, I’ll only have to focus on work and have more time for blogging. In the meanwhile, I still eat out — but just don’t have as much time to blog about it. Anyhoo, my latest food adventure was to a Lebanese restaurant (and apparently hookah lounge) in Miami called Layali*. The restaurant’s interior felt authentic/local, so I was pretty excited to see the menu. There weren’t very many people inside when we got there though — only one or two other tables — so maybe I shouldn’t have been so excited after all. I liked that the restaurant had lunch specials, which spanned $9 and $12 each. Fairly reasonable prices for lunch — in Miami. 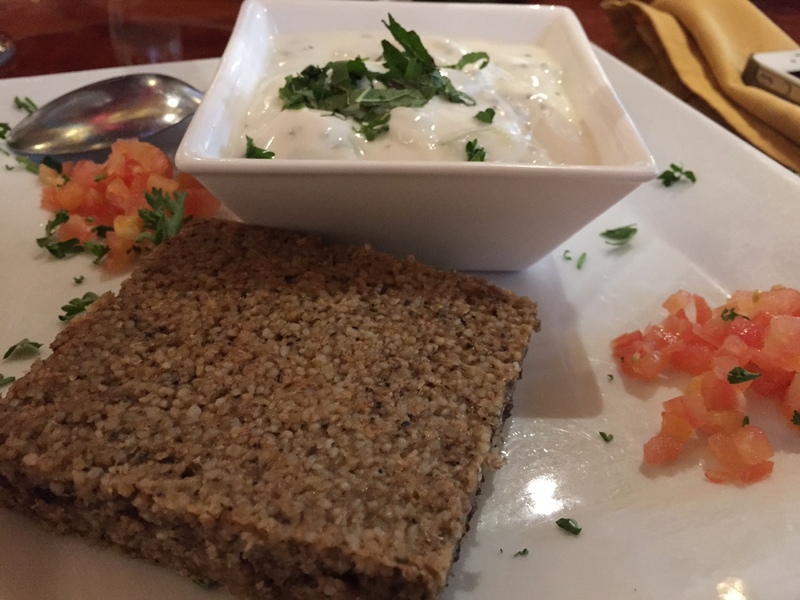 Feeling adventurous, I ordered the Meat Kibbe. I had absolutely no idea what it was, and had never even seen it on a menu before. It was described as “Meat and crushed wheat, filled with pine nuts, onions and minced, baked in the oven.” Sounded promising. Boy was I wrong! Firstly, I was pretty disappointed by the portion size. It was basically a 3-in by 3-in by (less than) 1-in piece of meat, which a lot of my colleagues mistook for a piece of wheat bread, accompanied by a square ramekin of yogurt sauce — I probably got more sauce than meat! There was also some diced tomato on the side, but it looked more like garnish than part of the meal. Taste-wise, I wasn’t impressed either. I mean, the meat was fine and didn’t taste bad or anything, but it wasn’t particularly tasty either. Kind of reminded me of plain meatloaf. The pita on the side was also not very exciting… I’d compare it to something you’d get at your general grocery store. Overall, I’d have to say this meal was solidly below average. I wasn’t very impressed, but to be honest, I didn’t think my last Mediterranean meal was all that spectacular anyway. Maybe I should try something else next time. Hi everyone! I know it’s been over a month and a half since my last blog post, but I figured since this would be my 100th, I’d want to write about something super special. Also, before I forget, I’d like to make a shout out to all my readers out there, without which I would have much less inspiration to blog! Now for this post, I’d like to share a meal I made myself, rather than one I recently ate. Since I had some time off from work — and school — during the last two weeks of December, I was actually feeling inspired to cook dinner instead of just plopping into an immobilized state on the couch. May I present… attempt #1! Firstly, if you’re wondering… no, I did not smoke the salmon myself! That would’ve just been way too impressive. I bought it from the local Publix supermarket — and I was even super lazy and bought the version with cracked pepper on top, so I didn’t have to season the fish myself. I like to call this #efficiency. I also bought a cup of Greek yogurt as an alternative to sour cream and cream cheese, along with a lemon. To make the dip, I mashed two to three ounces of the salmon into tiny pieces, and mixed into 2/3 cup of Greek yogurt, half a teaspoon of lemon juice, a small pinch of salt, and a large pinch of sugar. 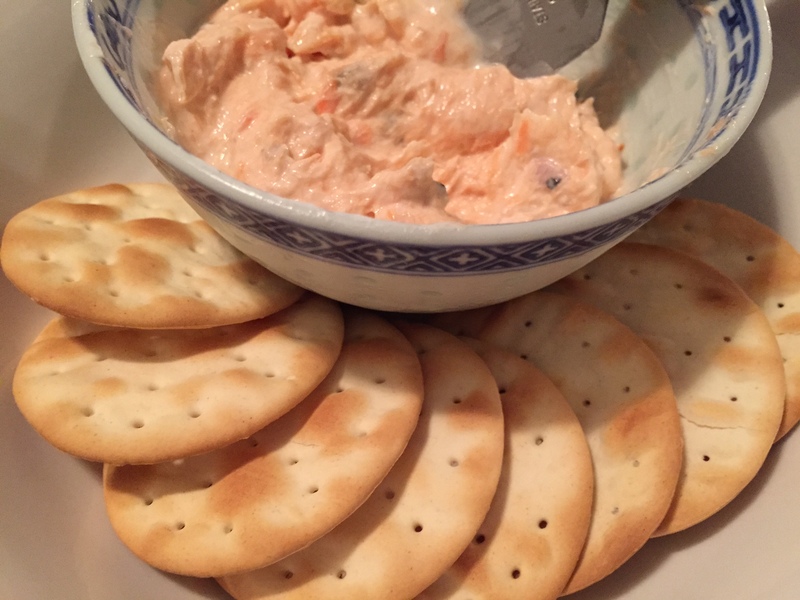 I only made a couple spoonfuls of the dip — because I was only cooking for two — but learned that a little salmon goes a long way, since those prepackaged items pack a lot of flavor, read: sodium! Add some crackers on the side, and viola… done and done! Since I’ve been in the mood for sushi recently, I frequented on of my favorite Doral sushi haunts, Sushi Sake. Since I dined with a buddy, you know what that means, right? Sampling! I’m all about lunch specials, and recently found one in Doral that’s worth blogging about! The Buzzer Beater* is a basketball-themed restaurant — stay with me here for a sec — with lunch specials that rank it in Doral’s top 20 list. At first I was pretty skeptical, since it seemed like your run-of-the-mill American restaurant, but since it was the only one of the top 20 that I hadn’t yet been to, I decided to give it a shot (har har) and went for lunch with a colleague from work. 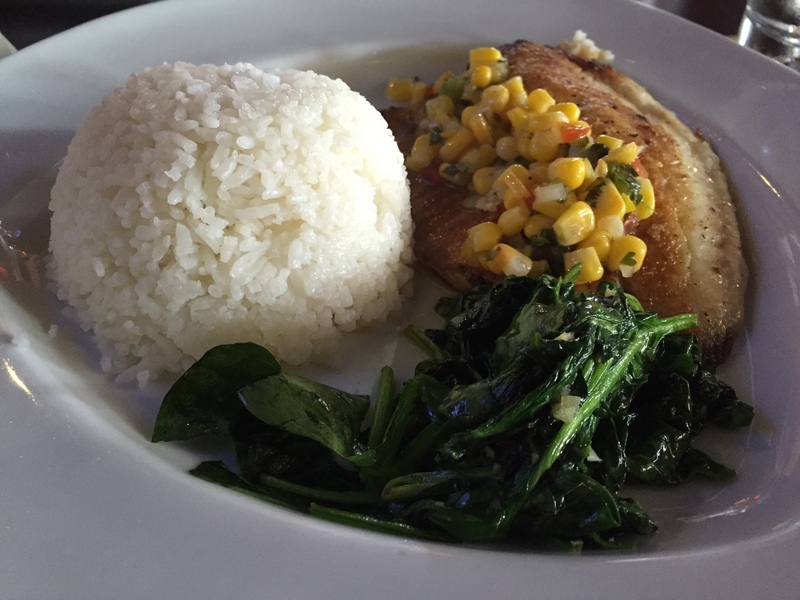 Scanning my options in TBB’s 2-minute menu and another lunch specials menu, I decided to go with the tilapia entree, which came with a lightly-fried filet topped with corn, and two sides of garlic sauteed spinach and jasmine rice. I gotta say, I was pleasantly surprised about what I got for $6.99. The fish — which, mind you was not a shrunken, puny dried-up square — was the slightest bit crispy and had good (i.e. enough but not too much) flavor, and the spinach was not wilted and soggy. The garlic even tasted fresh! And the portion of rice was a good size too. Glad I got a balanced share of meat, veggies, and grains! Overall, a good meal. I’d come back again to try their other lunch specials, perhaps even something from the the $9.99 specials list! Clearly, I’m overdue for a post. Well you’re in luck because today I had the pleasure of lunching in The Colonnade aboard the luxurious Seabourn Odyssey cruise ship while she was docked in Port Everglades! You can think of The Colonnade as an abbreviated version of the lido/buffet on other more contemporary cruise lines, like Carnival. It’s smaller-scale, but also noticeably tastier! It’s not often that a Seabourn ship visits South Florida, so I was super excited to sample. Since I approached the hot food station first, I actually started off my meal with an entree plate instead of appetizers. Here’s the salmon with bok choi (though if you ask me, I’m not so sure I recognized the bok choi there… ), with curried cauliflower and roasted pumpkin on the side. Note the very nice presentation of the salmon and veggies! FYI, the placement of the veggies was done by yours truly, as I was inspired by the rest of the plate. Remember that time I ate at Sergio’s and said I’d be back for seconds? Well, here I am! I stopped by for lunch again, and decided to try one of their lunch specials, the Picadillo Flatbread. 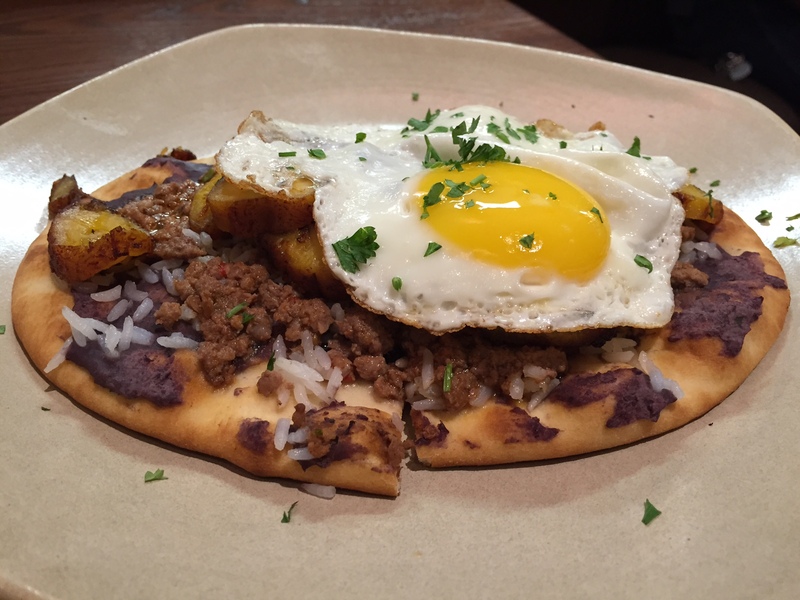 Ground beef, black bean hummus, white rice, sweet plantains, and a sunny-side up egg all atop a piece of flatbread. I give you… exhibit A. Looks good? Well, IMO it looks better than it tasted. The flatbread was a bit dry and hard, so I didn’t quite enjoy it, but overall the combination of ingredients was edible and flavorful — though I would’ve liked some more toppings quantity-wise. I regret paying $8 for the quantity of food I got because I finished eating it all before most of the others in my party finished their meal — and I’m usually one of the slower eaters of the group! — and was hungry for more shortly afterwards. Yesterday, a couple friends and I checked out a new Japanese restaurant in town. From browsing Kokai’s* website a few days before visiting — I always scope out a place before I go — I was pretty excited because the restaurant’s ambiance seemed modern and the menu featured some pretty tasty sushi and entree choices. Okay, I gotta be honest, I’m not a big alcohol drinker. So there will be no reviews about any sake in this post. (Sorry.) But… there will most certainly be a review about sushi! 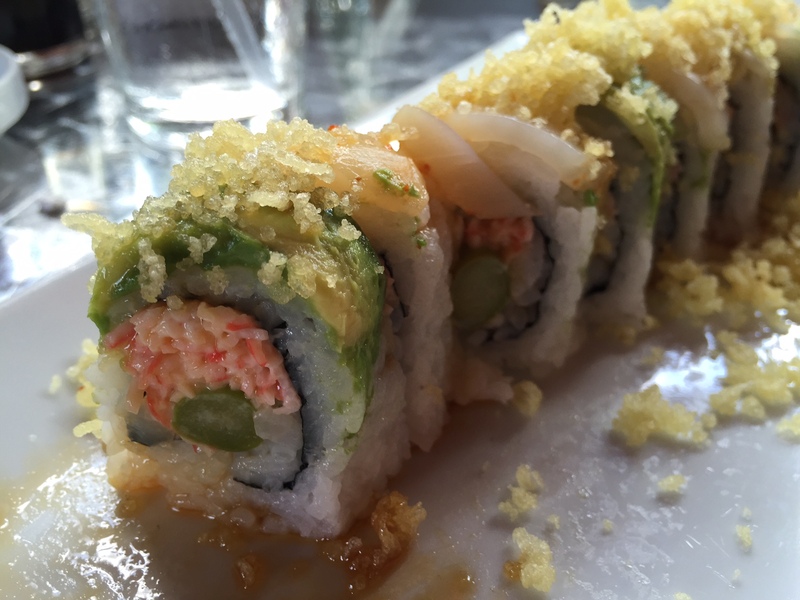 Anyhoo, back to the Marlins Roll… asparagus, krab salad, thinly sliced scallops, avocado, and tempura crunch served with eel sauce. I can’t recall ever having scallops atop sushi before and am definitely a fan of those clamsters, so I was totally willing to give it a try. And I don’t regret it at all. The roll was deliciously good! Sushi Sake has a pretty extensive sushi menu, so I would definitely go back to sample something else. Just reading the menu again makes me salivate! Prices are pretty decent too, with most rolls ranging from $7 to $13. I’m making up for lost time here, since I’ve eaten out plenty and clearly haven’t posted enough… so here’s my second post of the day! I recently tried out another “new” restaurant in Doral… Trattoria di Campo, an Italian restaurant located in the same plaza as Capriccio. I originally stumbled upon it after searching for “lunch specials” on Yelp, and shortly thereafter remembered that awhile back, an Italian co-worked had also recommended that I try it. After being seated at a table, while munching on the deliciously chewy-on-the-inside-crispy-on-the-outside bread and olive oil with cheese dip — this might be one of my favorite breads in the area — I considered my lunch options. Should I go with one of the $9.99 lunch specials or one of the $13.50 lunch specials? (FYI, I tried searching for an online version of the menus afterwards but couldn’t find it, so I came to the conclusion that the restaurant actually changes the specials menu from time to time.) I opted for the $9.99 combo, which included a bowl of pasta and a soda. Rigatoni in a tomato-based red sauce and… my default soda option, Sprite! Di Campo uses ingredients from Italy and also handmakes its own pasta — and you can definitely tell from eating it! 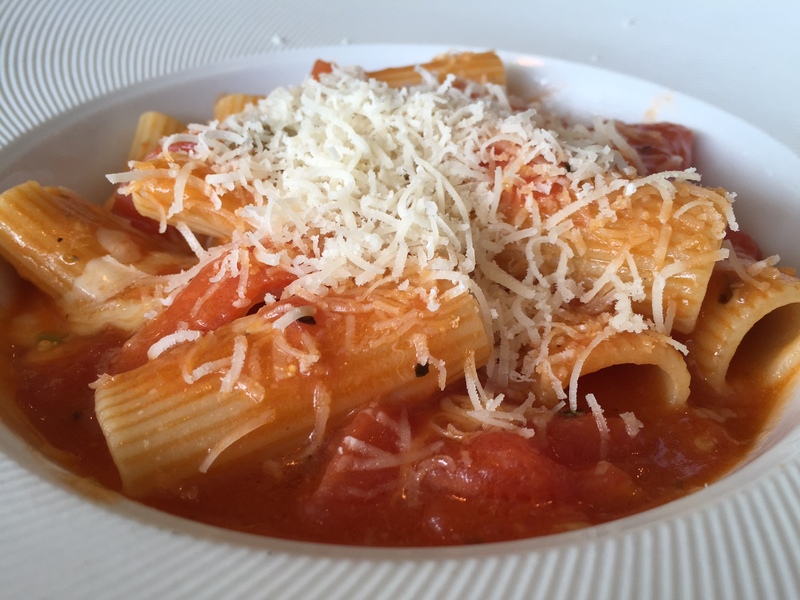 I thoroughly enjoyed the texture of the pasta, especially since it was cooked to a perfect al dente… not too soft like how pasta is cooked at many other restaurants. The tomato sauce was really tasty too, and included chunks of tomatoes. Also, notice the mountain of cheese atop the pasta… who doesn’t love cheese?! Overall, I think I might rate this as good!